In an attempt to bring the young to church, the Church of England has offered them gyms, desks and bicycle-hire schemes. But before all of this, there was Champing. The Church of England’s Victorian vicars fell into three categories: those who had gone out of their minds, those who were about to go out of their minds and those who had no minds to go out of. One West Country rector did not enter his church for 53 years and kennelled the local foxhounds in his vicarage. Another replaced his congregation with wooden silhouettes and swaddled his home in barbed wire. Whitwell Elwin was more sensible. A descendant of Pocahontas, he lived in the depths of rural Norfolk and edited the Quarterly Review, an influential Tory journal. Elwin had no architectural training but decided to build a new church for his parish of Booton. Like a magpie, Elwin picked features he liked from places he admired – Glastonbury Abbey, Skelton church near York, Trunch church in Norfolk – and threw them together in a gloriously eccentric Gothic creation, with two towers and mad minarets. Booton church took 25 years to build and was completed in the year of his death, 1900. It was in use for barely eighty years and, like so many other fine rural churches, now stands empty; still consecrated but struggling to find a role in modern times. 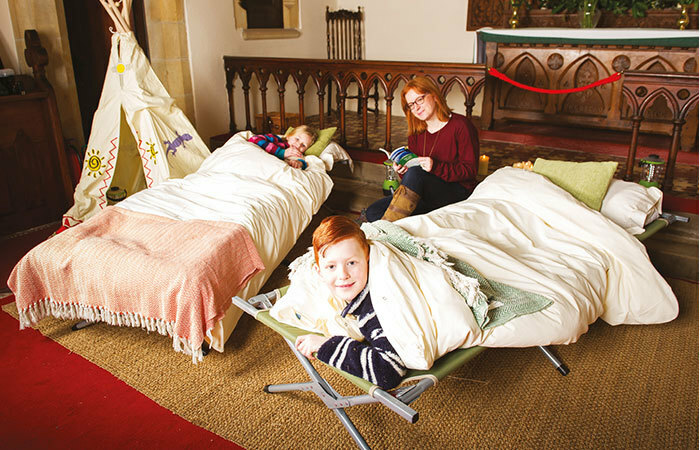 Two years ago, Peter Aiers, a regional director of the Churches Conservation Trust, which tends to 350 Anglican churches no longer in regular use, came up with an idea as eccentric as Whitwell Elwin: champing, or camping-in-a-church. 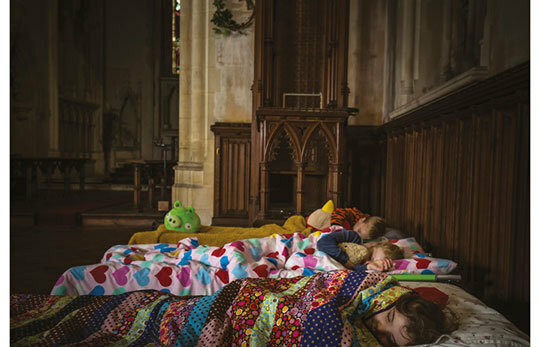 The charity put camp-beds inside four churches in 2015, eight in 2016 and this year is opening twelve, including churches in Somerset, Shropshire, Cumbria and even Orkney. This was why I found myself pushing on Booton’s heavy oak door at dusk, an owl hooting nearby, for a champing minibreak. Inside was a recognisable church, smelling of slightly damp stone. There was an altar and cross, an organ and parish magazines by the door. In the cavernous nave, the chairs had been stacked to one side and replaced with nine camp-beds. There was a rug and camping chairs in a circle, in front of a table decorated with electric candles and fairy lights. It was surreal but didn’t feel sacrilegious. I hadn’t stepped inside Booton church since I was a child. For the first nine years of my life, this was my parish church, then a place of regular worship. I listened to my dad singing loudly in the choir here, and saw my mum cry at a funeral. At Christmas one year, I was a mute shepherd during the carol service. A neighbour’s newborn girl was baby Jesus. The church was huge and full of people. Now it was huge and empty. My children were a little awed. ‘I love the windows when the sun comes through,’ said Milly, pointing to the beautiful stained-glass scenes. ‘I want it to be warm, not freezing,’ said Esme – we were visiting in winter, before the champing season (Easter to October) begins. ‘I want to go home,’ said Ted, who was scared of bats. Luckily, he didn’t see them darting around the beautifully carved wooden angels that swoop from the ceiling. Champers must bring their own bedding. We made our beds as the children played hide-and-seek, their voices echoing with delight as they found a secret door in the wooden panelling. Another hidden door led outside, where there was a very pleasant composting toilet in a smart shed. All twelve churches have been fitted with simple camping facilities but most don’t have running water. So there are no showers, and fires are obviously forbidden. There is drinking water, a kettle and tea, coffee and hot chocolate. I also packed instant porridge and noodles to keep us going. That evening, we retreated to the excellent Kings Arms in the pretty market town of Reepham nearby for a pub supper. When we returned to the church, I expected it to feel spooky but it was simply solid, safe and peaceful. The children eventually settled down to sleep. A deep tranquillity settled on the place, sending the adults to bed soon afterwards. Some might see camping in such a holy place as a symbol of the decadence or naffness of contemporary, secular society. A building that was once a preserve for elevated feelings of praise and worship is reduced to a leisure activity. Champing might be viewed as a sign we have not yet found an alternative use for these amazing buildings since they’ve been deserted by their congregations. In champing’s defence, though, it is a low-impact activity. The camp-beds, folding chairs and fairy lights can be swiftly packed away, if the church is required for worship. The composting toilet is a shed out back, which can be removed. Respectful campers leave no trace. Before I slept, I lay in my warm camp-bed, my cold nose pointing at the ceiling. I had never before slept in such a vast space, and its vaulted heavens, with ten flying angels in carved wood, drove me to wonder about the power of devotion. Some say the Church of England has become too obsessed with the shell and not the living body of people that brings faith alive. I can’t think of many experiences more likely to foster religious feelings than spending thinking time in a magnificent church. Whitwell Elwin wrote of his hope that its solemnity would ‘awe or soothe’ those who entered ‘into a like solemnity, and put them at once into a spirit of prayer’. Booton church was designed to enlarge us beyond our daily cares and I did consider my thoughts expanded by it. Late at night, as misty moonlight spilled through the windows, I imagined I was inside the mind of its creator, or possibly within a halfway house to heaven, here on earth. Apart from being woken by my three-year-old demanding warm milk, I slept more soundly than I had for weeks. Champing is not cheap for a basic night of camping but it is such a unique experience, and the money goes to such a good cause – the preservation and revitalisation of our disused churches – that I paid it happily. The full-price £59 adult rate includes breakfast. We headed to the Dial House, a splendid recently refurbished restaurant and boutique hotel, for a slap-up hot meal. Booton church seemed to place a calm hand on all of us. I felt a sincere gratitude for being allowed such a wonderful experience, thankful for the bravery of the Churches Conservation Trust. Permitting people to camp in church is a leap of faith. I was also appreciative of men like Whitwell Elwin who had the faith, audacity and generosity to build such grand public buildings, and build them to last. What a legacy; what a gift. If we haven’t quite worked out how best to use and enjoy ancient churches in the modern age, then champing is an imaginative and potentially inspirational start. Champing from £39 to £59 per adult (£10 to £19 per child) per night. Booking: 020 7841 0436 champing@thecct.org.uk; www.champing.co.uk.